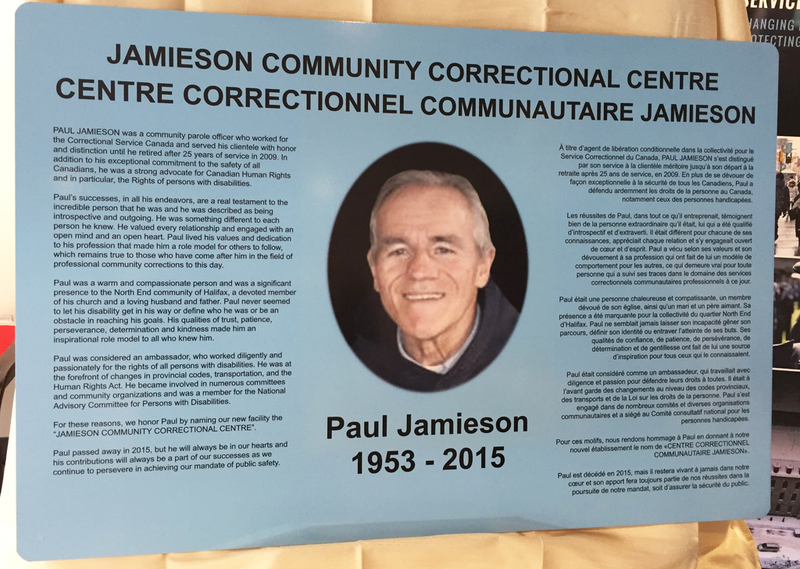 The grand opening of the Jamieson Community Correctional Centre in Dartmouth, NS was held on August 15, 2017.The CCC is named after the late Brother Paul Jamieson.Brother Jamieson was a well-respected Parole Officer with Correctional Service of Canada in the Halifax area for 25 years. 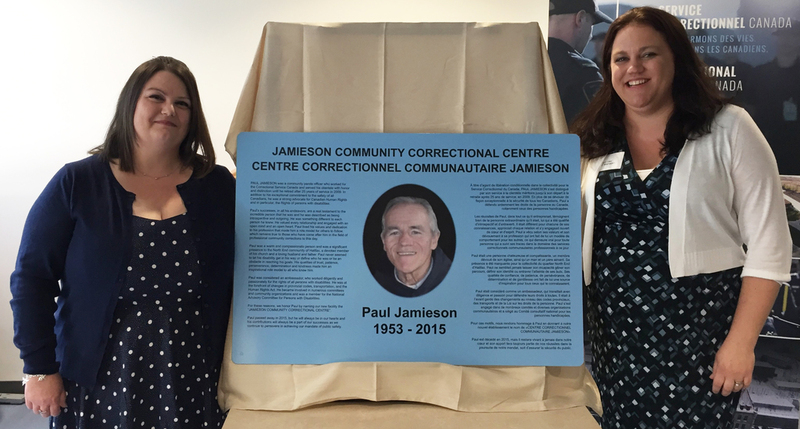 Given that the building houses employees and offenders under Correctional Service of Canada, it is fitting to have the building named after an influential Parole Officer who impacted so many employees within the service and members of the community. Sister Robyn Gay, colleague and USJE Local President of Nova Scotia Community Parole, Local 80073, along with employees and her members were instrumental in having the CCC named after Brother Jamieson. When Sister Gay first met Brother Jamieson she was a volunteer with the Independent Living Society.She was still in university and had started to volunteer with a program called ‘Opening Doors’; a program designed to help offenders with disabilities reintegrate back into the community.Brother Jamieson was a board member and also instrumental at developing the program which was one of a kind within CSC at the time and was an early version of what the Community Mental Health Strategy does today.Brother Jamieson took her under his wing and encouraged her to volunteer with CSC and explore parole.With time and patience, Brother Jamieson mentored her and never once became frustrated explaining step by step how to complete a task.As much as Sister Gay was helping him perform his daily tasks, he was helping her 100 times more; to be a better person; a better friend and a better Parole Officer. Brother Jamieson was a wonderful mentor and was a great friend.With everyone he met, he would share a friendly hello and a smile.More often than not, they would come over and great him with a story and a laugh. Brother Jamieson was originally from Prince Edward Island, however ended up settling into the North End of Halifax. He was a proud Islander and also a proud North Ender. He attended Saint Mary’s and Dalhousie Universities, and graduated with degrees in Sociology and Social Work. He went on to work as a Parole Officer with Correctional Services Canada, retiring after 25 years. Brother Jamieson had a passion for fighting for the rights of all persons with disabilities. He worked tirelessly for changes in provincial codes, transportation, and the Human Rights Act.He became involved in numerous committees and community organizations. He was the provincial coordinator with LEO (League for equal opportunities).He organized conferences for the sub groups in the province working on accessibility. He along with two others developed the blue and white parking logo that is used in disabled parking spaces and lobbied the government for accessibility in Halifax.Their goal was to change provincial codes, transportation codes and the human rights act.They had many successes due to his commitment. Brother Jamieson was a member of the local Halifax group named DIAL (Disabled Individual Alliance league) for 10 years. Their goal was lobbying government so that disabled concerns would be heard.He held many positions in the organization. For over 10 years, Brother Jamieson and several others worked on creating Peer Partnership.This had lots of success in Halifax and then it changed to the Metro Resource Centre for Independent Living.He felt that some disabled people needed an infrastructure in place to help them organize their lives after a major tragedy or illness and they created the centre to help people navigate through the various systems to get the services they needed. 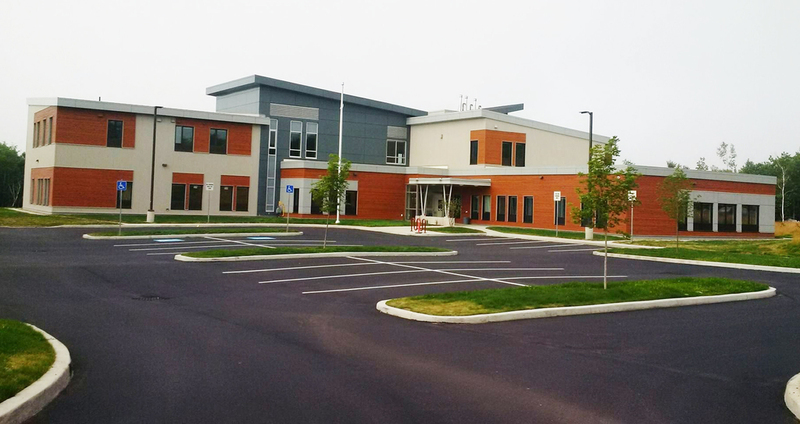 He was founder of Opening Doors, an innovative program through the resource centre to help with the rehabilitation for offenders with disabilities.This program ran for four years and in that time, there were approximately 80 offenders with varied disabilities who benefited from this program. While working for Correctional Services Canada, Brother Jamieson was a member of the National Advisory Committee for Persons with Disabilities.This committee met in different provinces every summer to discuss issues that needed to be resolved.He travelled from the East coast to the West to represent the concerns of the Maritime region for 10 years.As the elected chairperson he organized the Halifax conference in 1996.Many changes were implemented to ensure that CSC staff and inmates had their medical and physical needs met. Brother Jamieson also worked as a volunteer on the Nova Scotia task force on Primary Health Care.He represented the disabled community and the changes they wanted addressed. This committee had many doctors from the Atlantic Provinces, as well as, specialists but he was the only disabled person representing the disabled concerns.They meet regularly on Friday nights and Saturdays to identify the medical needs in the province. Brother Jamieson was also an active member of his church. Those that knew him knew how important God was to him.He taught Sunday school for several years at his home parish. What hasn’t been mentioned yet, is that Brother Jamieson had completed the above from his wheelchair.There is an old saying that life is 10 % of what happens to you and 90 % of how you react to it.Brother Jamieson was the embodiment of this concept.After a spinal cord injury when he was younger resulted in him being a quadriplegic, it was something that he didn’t let define him. For many, Brother Jamieson was the first quadriplegic that they met.Being in a chair didn’t stop him from being the best he could be; it just meant that he had to do it differently.Some things may not have worked out the first time but with his sense of humour and determination, he went back at it until he succeeded. Brother Jamieson continues to influence many of the people who work at CSC to this day.Sister Gay is the representative from the Atlantic Region that was part of a working group for Employees with Disabilities.While working on this plan, she was able to incorporate what she had learned from Brother Jamieson to create this plan and continue the advocacy for employees with disabilities which he begun many years ago. Brother Jamieson has had a significant influence on the community in which he lived and worked and has touched the lives and hearts of those who came in contact with him.He was certainly an inspiring public servant, USJE member, hardworking and dedicated to his career and community who paved a path for many to come. A gentleman in every sense of the word, Brother Jamieson’s quiet, humble yet effective ways of leadership by example set the standard for others to follow.He also possessed the rare talent of knowing when to be "not so subtle" in his advocacy work when necessary. Paul Jamieson is a name that represents the kind of person every individual should aspire to become.There are several employees who have come up the ranks under Brother Jamieson’s wings and they talk about ‘embrace our inner Jamieson’ when working with people in need.We would like to think that each and every person who walks through the doors of the Jamieson Center will approach helping others with the same thoughts and beliefs. He is truly missed, but his legacy to his community will not be forgotten. We are very proud to have attended the opening and thank Brother Jamieson’s wife, Marilyn and Daughter, Jenna for being there as well.